When people play mobile games, their genre choices often change from what they would prefer on a console system or a personal computer. Just what do people prefer? The reason why may be related to size and interaction of most gaming devices. We all know touchscreens offer an entirely different user experience, and many phones only suit a smaller format. 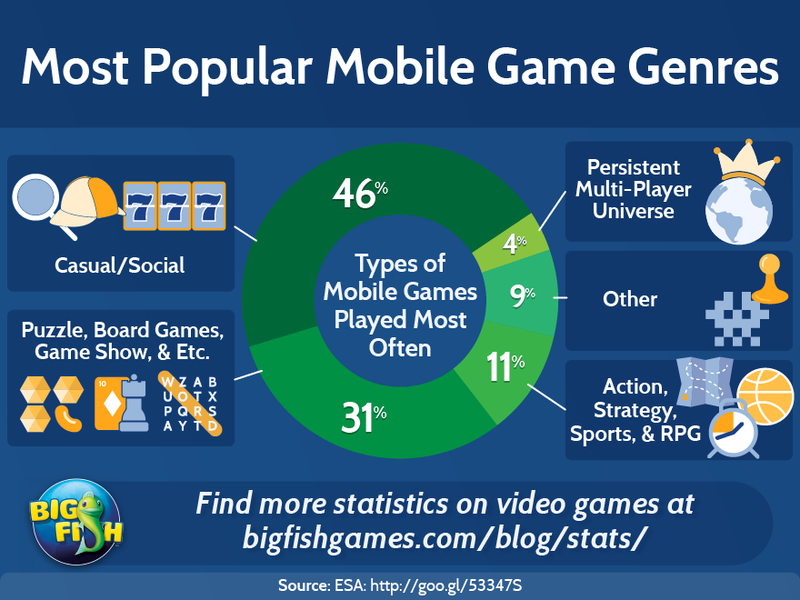 This graphic shows the breakdown for mobile gaming genres. Casual and social games are by far the most popular, with 48% of respondents playing these most often. Next in line are games like Word, Puzzle, Match 3, Marble Poppers, Mahjong, or Solitaire with 31%. More action or fighting-oriented games like Adventure, Arcade & Action, or RPG usually rate very highly in console and PC games sales globally, yet only account for 11% of most played games in the mobile setting. “Other” games account for 9% of most played, and we won’t even try to guess the oddballs in this category. Least popular in a mobile format is Persistent Multi-player Universe games like WoW and Final Fantasy. These big hits at home don’t seem to translate well into mobile options. It’s so interesting to see the difference between mobile gaming preferences versus console and PC game preferences. It seems that there truly is a niche for everyone’s tastes.